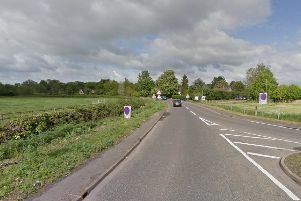 A motorcyclist was injured in collision with a van in Wimblington this morning. Police and ambulance crews were called at 10am to the crash in Blue Lane at the junction with Addison Road. The motorcyclist, a man, believed to be in his 20s, was treated for neck pain and a wrist injury. He was taken to Hinchingbrooke Hospital for further care. While clearing the road of debris police also managed to apprehend this four legged friend who had escaped from a nearby garden. The dog was reunited with his owners.